A night of food, drinks, and trivia questions isn't the traditional way to celebrate national "Tell a Fairy Tale" day, but it sure is a fun one. Whether you're a fan of the Germanic cautionary tales like The Brothers Grimm suite, mischievous Irish leprechauns duping peasant-folk, or a connoisseur of the more Zen Eastern varieties like Straw Millionaire (it's the one about sequentially bartering for items of ever-increasing value), we've all got our own particular favorites that have stuck with us through growing up. 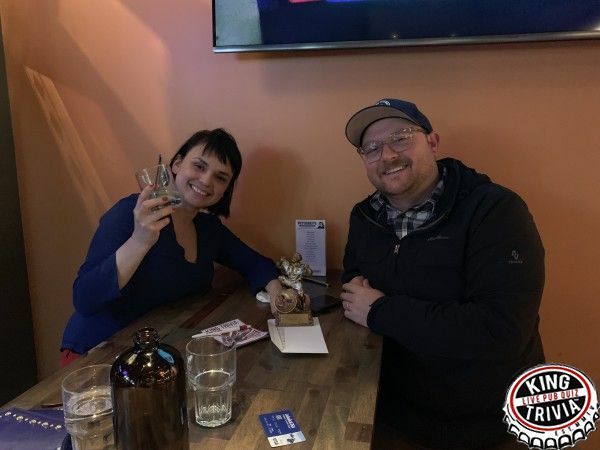 But absolutely none of that knowledge would have helped you here tonight because while this may have been someone's favorite off-brand national holiday, for us here at King Trivia, it was just another Tuesday. Seriously though, the real reason is that we never base our questions on something that people could easily guess or look up ahead of time. But that raises the question, what facts and figures did we talk about on this Tuesday as we hurtled around the sun at over 67,000 miles per hour? Sorry it wasn't astronomy related either, I don't know why I said that. And with that non-sequitur of a segue let's begin the weekly recap. We had five teams joining us tonight: Zamboni, Cornstache, The Bean Burritos, Summer Sausage + Guest, and McButt. We started things off with our General Knowledge Round 1 where teams faced a barrage of questions from a variety of subjects. Whether it was taking our brains to flavor-town by identifying the brand behind the famous Half Baked ice cream flavor (Ben and Jerry's), or surgically deploying our mental acumen towards recollections of the animal organs that were once used to make footballs (bladders), everyone got a little taste of what King Trivia questions have to offer. Things moved on to our Picture Round 2 where teams had the complex task of uhhh, well they had to cleverly untangle the complex web of...okay they were just looking at pictures of kinds of berries and naming them. I don't know, you had to be there; it was harder than it sounds I swear (Would you recognize Berry Gordy? I didn't think so). And if it was so easy then why did we have a nice point differential leading to the following standings: Cornstache had the lead with 14 points, second place was held by The Bean Burritos at 11, third place was tied at 10 points by McButt and Zamboni, and Summer Sausage was the caboose of our food train with 9 points. Theme Round 3 was all about Politics, Politics, Paul/a-tic(ks) (every question or answer had to do with famous Pauls, Paulas, or tic(k)s). We had all the greats make an appearence, Paul Rudd, Paula Abdul, Tic-Tac-Toe. But it was the question about what musician that ditched his "Art" in 1970 to become a solo artist that most teams missed by incorrectly guessing Paul McCartney (it was Paul Simon, who left Art Garfunkel behind). But it wasn't entirely their fault, after all, Beatles music was playing in the background throughout this round so there was some subconscious manipulations afoot. Our Guess Who? 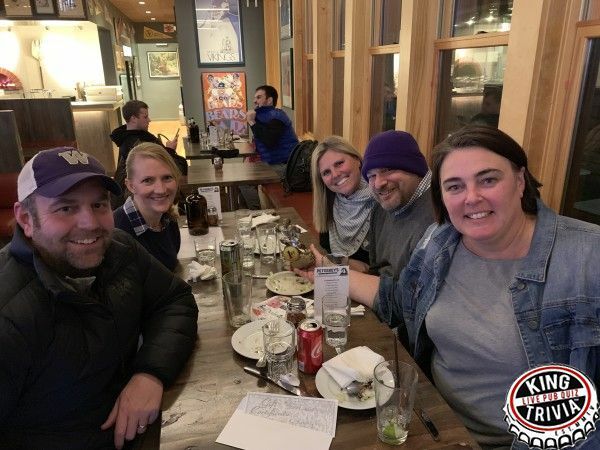 Round 4 may have seen the early departure of Summer Sausage, but the rest of the teams were finally getting warmed up as they puzzled over our clues about a well-known doctor who is famous for something entirely unrelated to medicine. McButt and Zamboni recognized our mystery celebrity after the 8-point clue mentioned appearances on Curb Your Enthusiasm and Entourage, while Cornstache and Bean Burritos had to wait for the 6-point clue revealing their film debut in Knocked Up. For those following along at home, I'll give you a moment to try to guess who it is before I tell you the answer was Ken Jeong. Oh shoot, my bad; pauses work better in verbal communications as opposed to text communications. Before we jump into our Find the Connection Round 5, let's get a quick score update. Cornstache was still holding onto their first place lead with 34 points, but McButt had muscled their way into second at 30 points. The Bean Burritos weren't about to let them escape however, as their third place standing at 29 points was just a hair's breadth away. Zamboni was now our custodial caboose with an icy smooth 24 points. I'll workshop that analogy some more, there's untapped potential in them hills I swear. We had a much more straightforward connection in Round 5 than previous weeks (hardware tools), and we also had some easier questions as well. Whether it was recognizing the military position of a drill sergeant or knowing the artist behind the 90's smash hit "U Can't Touch This" (MC Hammer), it turns out there's not that many kinds of tools that could realistically be the answer to a question. That doesn't mean every question was a slam dunk though, nobody knew the identity of Nora Ephron's Steve Martin Christmas Comedy Mixed Nuts (but I congratulate our teams for being able to come up with another Christmas movie with a tool in the name: Christmas with the Cranks). Speaking of slam dunks, have I told you about our Handout Round 6 yet? 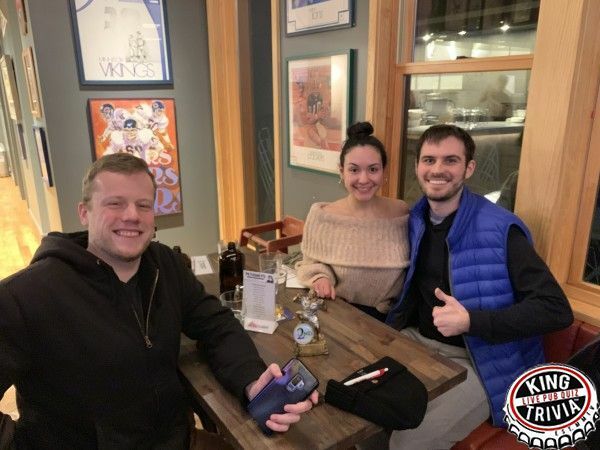 Frequent players of King Trivia have probably noticed that you can traditionally expect on a few sports related questions to pop up here and there throughout the night, but tonight was a major exception because this entire Round was centered around sports knowledge. Teams had to match famous star athletes based solely against a paired list of their former teams. For example, Michael Jordan would be matched with Chicago Bulls / Birmingham Barons. As someone who pretty much just follows soccer, this wasn't exactly my forte, and our teams decided to really drive that point home by putting up a astonishing 95% average accuracy. And one team in particular took their game to the next level by successfully pulling off a Double or Nothing for a sweet 20-point basket-touchdown (is that right, did I do the sports good?). So it should be no surprise that Cornstache's first place lead grew nearly insurmountable at 54 points. The Bean Burritos were a distant second at 39 points, but McButt was keeping things competitive by staying nearly even at 38 points. And Zamboni had significantly closed their point gap by climbing up to 34 points. But while first place may have been locked up, how would the race for second and third place shake out moving into our Final Round? What are 10 of the 14 periodic elements that are represented by a 1-letter symbol? And while there are some elements that have permeated the general consciousness like Carbon (C) and Oxygen (O), we had some deep cuts like Tungsten (W) and Yttrium (Y) that nobody bothered with trying to come up with. And it turns out that teams didn't really need a full elemental collection in their repertoire, as they ended up putting together a collective accuracy of 85%; a showing nearly as strong as their sports round performance. Sports, chemistry, types of berries...Is there any category of knowledge that our Petoskey regulars can't crush? But as much as I'd like to sing the praises of all our teams and players, I still have to award our top-3 placements at the end of the night. As you already know, Cornstache took home the peak of our winner's podium with a 63 point finish, but the remaining teams were spaced out by a meager 3 point margin. Second place at 47 points was narrowly taken back by McButt, as they edged past the Bean Burritos 45 point third place finish. But Zamboni was inches away from being able to close out their come-back victory, having ended the night behind just one point at 44. Congratulations to all our teams for their efforts tonight, I had a great time and I hope you did too. I'll be here next week as we look to celebrate....give me a second to check my national holiday calendar...okay, National Multiple Personality Disorder Day. Oh god, um, let's pick a more cheerful one shall we? Oh here we go, National Absinthe Day, now we're cooking with gas. And remember, BYOA guys, bring your own absinthe.